This stately looking single-level home is ideal for a narrow lot. The design lays out the rooms in two distinct wings, the left one housing the common areas, the right, the bedrooms. The foyer opens directly into the great-room, which offers an optional gas fireplace. A few steps away, a counter-lined kitchen shares a 42-inch eating bar with the dining room. 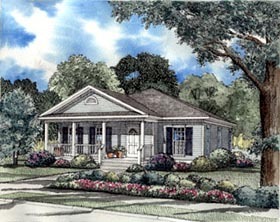 The master suite occupies the rear corner of the home and features its own walk-in closet and full bath. The other two bedrooms are accessible in the front of the home where you will also find a storage room, linen closet, and full bath. This home is designed with slab and crawlspace foundation options.